Liam Watt works his way down the line for the Fifers. Pic by Kenny Mackay. There's no denying this was a completely out of sorts performance from the Fifers. Everything that fans have come to expect from the side over the past few months was missing. 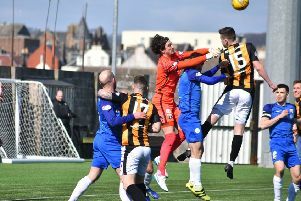 East Fife have been lethal in attack and ruthless in defence recently, but were found lacking in both departments on Saturday afternoon. Almost from the very first whistle Mo were on top, and apart from a brief spell at the start of the second half, dominated their hosts. The Fifers were missing Daryll Meggatt from the starting line-up and his absence cannot be understated. He also missed the Dumbarton game recently, a game when East Fife were again convincingly beaten. The centre half has become a key player for the side and whenever he misses out it seems to completely knock the Fifers out of their stride. But credit must go to Montrose, too. The visitors were really impressive, and there's no doubt Stewart Petrie's side will win more than they'll lose between now and the end of the campaign. They got an early lead, Euan Henderson blasting past Craig McDowall after barely 120 seconds of the game played. The home defence was guilty of backing off the on-loan Hearts teenager and he punished them. It should have sparked East Fife into action but instead it was Montrose who looked more likely to net the game's second goal. Craig Johnston should have done better when he stole possession from Ross Dunlop only to fail to get his shot away. East Fife had a brief flurry towards the end of the first half, Scott Agnew having a close range effort blocked. Darren Young was clearly unhappy with what he had seen in the opening 45 and made a couple of changes at the break. Craig Watson and Liam Watt were hooked for Anton Dowds and Scott Linton. The move almost paid off straight away, with a Dowds header having to be cleared off the line by Iain Campbell. Ross Davidson then pulled a decent stop out of Allan Fleming as East Fife appeared to be clicking. But alarmingly they fell out of the game quickly, and Montrose went on to make it 2-0 from the spot. Chris Kane brought down Henderson inside the box allowing Martin Rennie the chance to increase his side's lead. East Fife had a late chance to haul one back but Kevin Smith couldn't convert from close range. Boss Young said: “It’s frustrating. “The better team on the day won but had we got the equaliser at 1-0 we could have gone on and won like we have done in the past. “But the goal never came. “We made a few changes and overall it’s disappointing because of the way we’ve been playing and the standards we’ve set this season."